Let us go back to Capernaum-by-the-Sea, where Peter and Andrew lived, and where Jesus often stayed. 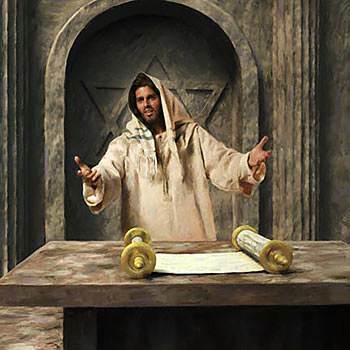 At the synagogue church in Capernaum—the one to which Jesus went with Peter—there was a man called Jairus, who was a ruler or chief man in the synagogue. Sometimes his little daughter went, too, with her mother. 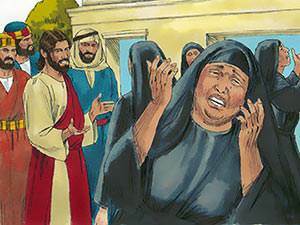 She was so glad when Jesus was at the synagogue. Twice He made sick people better when they were there to learn about God. The little girl liked to hear Jesus talk to the people in the synagogue. 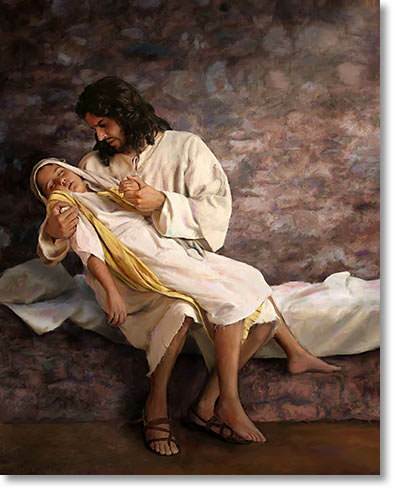 Jairus loved his little daughter very dearly. She grew to be twelve years old, and one day he was very troubled, for she was ill. She did not run about and play or help her mother in the house. She lay on her little bed with flushed cheeks and heavy eyes. She had fever, and she grew worse each day. At last her mother and father felt sure she would soon die unless something was done. Jairus said, "I will go and look for Jesus." He went to Peter’s house, but Jesus had gone across the lake. He hurried to the shore, hoping to see Jesus coming back. To his joy Jesus stepped out of Peter’s boat just as he got to the shore. 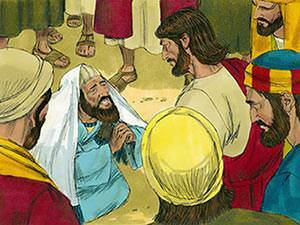 Jairus knelt down on the beach, and begged him, saying, "My little daughter is nearly dead. Please come and lay your hands on her, that she may get better." Jesus went with Jairus and a great crowd followed. When they were partway there they saw some friends coming who looked very sad. These said, "Your daughter is dead. There's no use troubling the Teacher now." But Jesus said, "Don’t be afraid," and went on. At the house there was a great noise—many people crying and wailing. Jesus went in and said, "Why make such a noise and weep? The child is not dead, but sleeping." 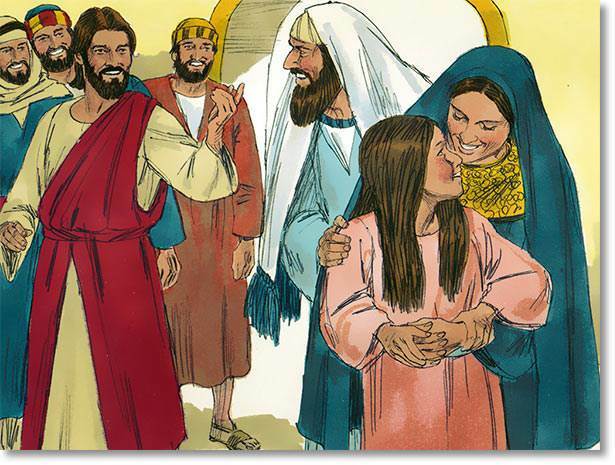 Then He went into her room with her mother and father, and Peter, James and John. 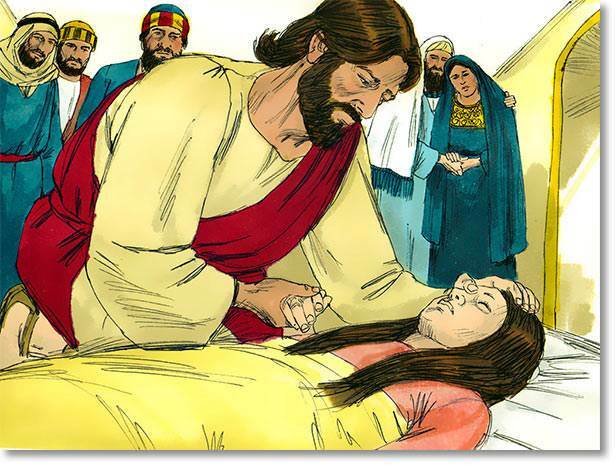 And taking her by the hand, He said, "Little girl, wake up," and at once she stood up and walked. 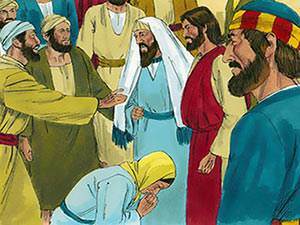 How thankful Jairus and his wife were to Jesus! 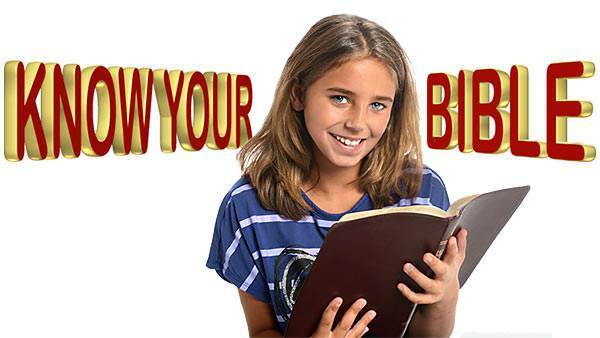 Then Jesus turned to the little girl’s mother and said, "Give her something to eat."